SOAR Ravelry Group – You must be a member of Ravelry to view, sorry to those who are not. My Flickr photos from SOAR 2010 Sorry, my camera was AWOL much of the time! Robin Russo does not have a website. Judith Mackenzie does not have a website. Episode 5- Longwools/The New Training Levels Are Here! The list of the new Training Levels is here! Sue will be publishing a them soon (hopefully real soon). New Training Levels software for you iPod and iPhone! Search for Levels in iTunes! This is based on the new version of the Training Levels that Sue Ailsby is currently writing. The old version of the Training Levels can be found here. Adam working the new Training Levels. Episode 3 <-Click Here to Listen! Fulling Yarn Part 1 Jasmine of The Knitmore Girls showing how to full a yarn. Notice she is doing this to yak down. Fulling Yarn Part 2 The rest of the fulling process. Spunky Eclectic Amy King, author of Spin Control, website. Sorry, Judith Mackenzie McCuin does not have a website. Song And The Sheep How Sue Ailsby taught Song to behave herself around sheep. Another story about Quark Written by the man who handled him during his VST attempts. Types of Sheep From Sheep 101 website. Breeds of Livestock/Sheep Part of Oklahoma State University extensive archive of domestic animal information. Sue Ailsby’s Website Both her dogs and llamas. Training Levels The main link to the information about the Training Levels. Yahoo Email Group For The Training Levels An email based group where you can email back and forth with other people also working on the Training Levels with their dogs. Level 1 Here are the behaviors and expectations for level 1. Sue Ailsby’s Training Rules Good reading. Training Levels Tracker An online source for keeping track of your training progress. You can create an account and join in the fun. Link to spread sheet to keep track of your training. This is in Google Documents. Episode 1-About Rayon/What is Clicker Training? Episode 1 <-Click here to download episode. Rayon Manufacturing Process A technical discussion of the history and manufacturing processes for rayon. FTC Article Concerning “Bamboo” Rayon Article from the US Federal Trade Commission concerning the marketing and label of “Bamboo” rayon fibers. Patches, 1990-2007, the dog who started it all with me. Here she is pictured at 13 years old enjoying a cool morning. 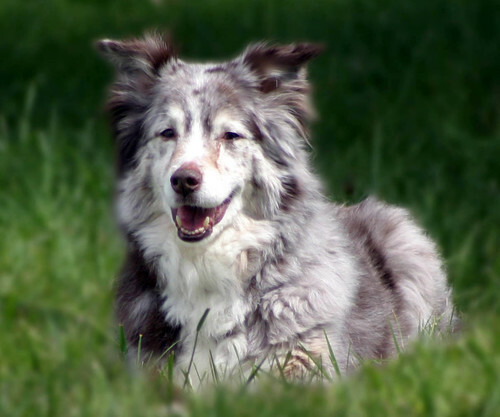 She was a red merle Australian Shepherd. Glossary of Clicker Training Terms Definitions of terms you will hear as you read about operant conditioning and clicker training. Clicker Training Primer An introduction to clicker training from the ClickerSolutions Yahoo Group. Overcoming Fear Of The Clicker Very important if you have a sound sensitive dog. Believe me, it’s not fun to watch the dog run away the first time you click. Training Levels-Sit Here is the link to explain how to lure a sit for the level 1 and the requirements to “pass” the level 1 sit. There is also the information about training the sit through all the levels. Don’t let the higher levels intimidate you, right now we are just concerned about getting your dog and you comfortable with using the clicker to train. The music is Smiling South by Brian Kelly and is courtesy of Music Alley. This podcast will cover various areas of handspinning and about clicker training your dog yourself by following Sue Ailsby’s Training Levels. You can PM me on Ravelry. My userid is ellenspn or you can email me at clickspin at gmail dot com. Please excuse the strange rustling noises. My Australian Shepherd puppy Masi was “helping” me.